Forty years ago, at Euro 1976, we saw the first major international tournament decided by penalties. Czechoslovakia beat Germany 5-3 with one of the most famous penalties ever seen (‘the Panenka’ chip down the middle). Before then, drawn matches were often decided by coin tosses or the drawing of straws. Given this curious origin, it is no wonder that penalty shoot outs have intrigued football fans. Many theories exist as to what does and doesn’t work. Should you trust left footers to take a penalty? Do experienced players perform better than young ones? Does a goalkeepers antics affect their opponent? 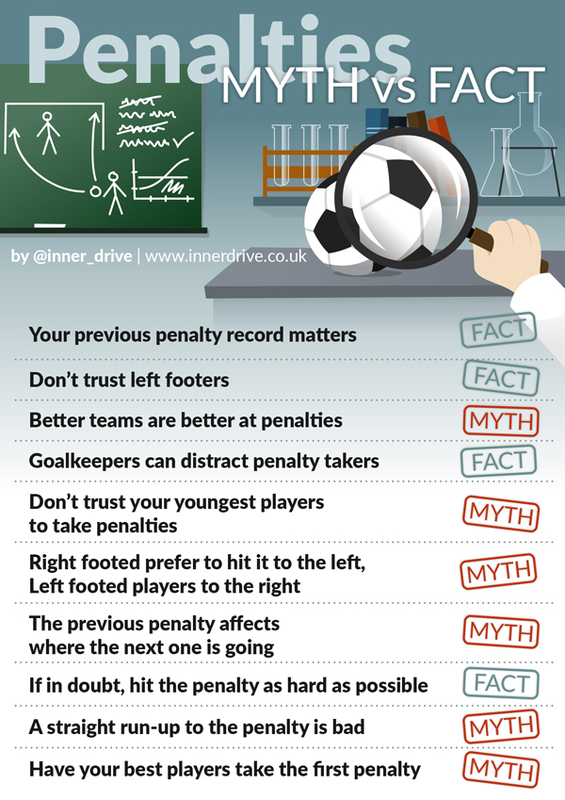 This blog looks at 10 penalty taking beliefs and distinguishes between myth and fact. A quick look at the success-rates of the major nations at Euro 2016 suggests that some teams are much better at penalties than others. Belgium have the best record (winning 100% of penalty shoot-outs), followed by Germany (71%), France (50%) Italy and Spain (both 33%) and finally England (17%). However, what actually matters most isn’t your country’s record in all penalty shoot-outs ever, just the last two. This is bad news for Belgium fans whose impressive record actually masks that they have only been in one penalty shoot out in the World Cup 1986. Researchers have found that if your team has lost their last two penalty shoot-outs they only have a 57% chance of winning the next one. If they have won the last two penalty shoot-outs then this number jumps to 89%. This is good news for Germany and Spain (who have won their last 2 and 3 penalty shoot-outs respectively) and bad news for England who have lost their last three (Euro ‘96, World Cup ’98 and World Cup ’06). At first glance, the stats seem to suggest that there is not much difference in how successful left-footed players are at taking penalties (73% success rate) compared to right-footed players (76%). 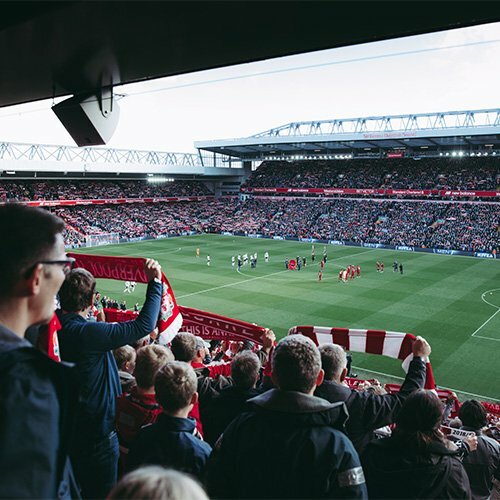 However, researchers have noted that if you just look at penalty shoot-outs from the last twenty years, the success rate for left-footers drops to 58% (success rate for right-footed players has remained over 70%). It is hard to say exactly why this may be the case (it could be down to better scouting or because goalkeepers are getting better at reading left footed players). Either way, the message is clear; don’t trust left-footers to take your penalties. 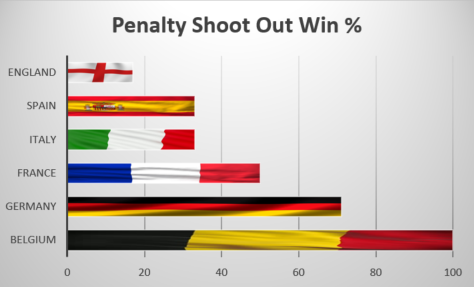 The most successful type of penalty was one that was hit at 75% of maximum power. It suggests that a combination of power and placement is best. However, what to do if in doubt? If you hit it softly, it increases the chance of hitting the target, but also dramatically increases the likelihood of the goalkeeper saving it (resulting in scoring 47% of the time). If you hit it with 100% power, you are more likely to miss the target, but the chance of the goalkeeper saving it if it is on target is very small (resulting in scoring 63% of the time). So if in doubt, hit the penalty with maximum power. Do the antics of the goalkeeper before a penalty shoot-out affect how likely it is that the opposition player will score? When Dutch goalkeeper Tim Krul successfully came off the bench one minute before a penalty shoot-out in the World Cup Quarter Final against Costa Rica in 2014, he was very confident that he could out psych his opponents. He said, “I tried to get in the minds…I told the players I knew where they were going to shoot to make them a bit nervous”. 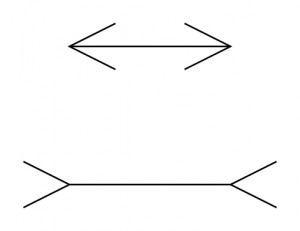 The bottom line looks longer than the higher one, despite them being the same length. Goalkeepers can perform a similar illusion by making themselves look taller and wider by adopting an extended H or X shape by spreading their arms above their head. The second thing to do is to stand 6-10 cm off centre of the goal (i.e. marginally to the left or the right). This makes one side of the goal 2.9% wider than the other. This tiny difference results in the penalty taker aiming for the slightly larger side almost 60% of the time. Knowing which direction your opponent is more likely to shoot can be used as a key advantage for goalkeepers. How does an underdog that scrapes a draw and gets to a penalty shoot-out with a team who is ranked much higher than them fare? It turns out to be very well. 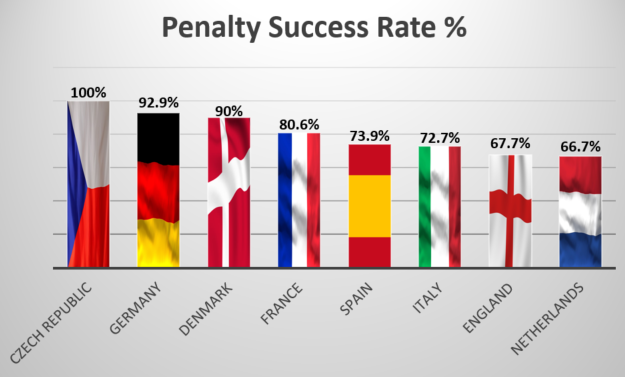 Teams such as Czech Republic and Denmark have a great overall success rate for penalties (Czech Republic players have scored 20 out of 20 penalties, with Danish players scoring 9 out of their 10 penalties in major tournaments). These stats are far better than players from France, Italy, Spain and England. If you had to choose one player to take a penalty for you, would you choose your current star or your young prodigious player? Most managers, fans and pundits would go for the current star. Eager to find out if this was the correct strategy, researchers divided players into two categories; ‘Current stars’ and ‘Future stars’. Current stars were those who had already won World/UEFA/South American Player of The Year or Top Goal-scorers in their leagues or at major tournaments. ‘Future Stars’ were defined as players who would go on to win these awards later in their careers. They found that “current stars” scored on average, 65% of the time from the penalty spot. “Future stars”, scored 89% of the time. This difference was explained in a similar way to why underdog teams outperform better teams. The better the player, the more they worried about what failing would mean to their status. 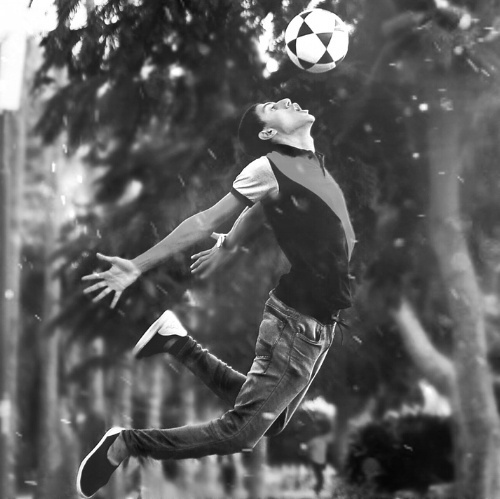 Whereas younger players see the penalties as a stage for which they can make a name for themselves, and subsequently perform better. Do players have a natural side to aim their penalty kick at? It seems so. For right-footed players, it would be more natural to aim for the left corner (from the kicker’s perspective). The reverse is true for left-footed players. 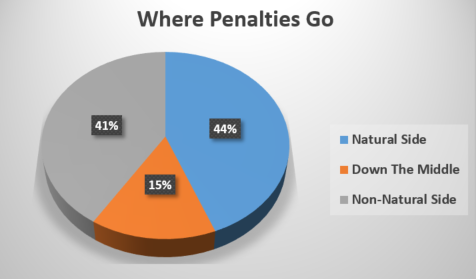 In a study of almost one thousand penalties from the Bundesliga over 12 years, players chose to hit the penalty to their natural side 44% of the time, in the centre 15% and to their non-natural side 41% of the time. This difference is so marginal, it probably isn’t significant enough to say that right footed players prefer to hit it to the left and left footed players prefer to hit it to the right. You are a goalkeeper in a penalty shoot-out. The last three penalties have been scored in the bottom left hand corner. The next player is about to take their penalty – where do you dive? If you decided to dive to the right, thinking that after three penalties in a row to the left this next one will surely go to the right, you are in good company (70% of goalkeepers at World Cups and Euro Championships do the same). However, you would all be wrong. This decision making is known as ‘the gamblers fallacy’. This is where you think previous events must even out at the next one. It is like thinking that after three reds at the roulette table, the next spin must be black. The truth is, each spin is independent. This is relatively true for penalties too. The author of this research states that ‘complete randomness is generally the best strategy in competitive games’ as this removes the gamblers fallacy. Is it better to have a straight run-up like Thomas Muller or come in at an angle like Eden Hazard? The answer is that it doesn’t make much of a difference. The wider the angle of the run up allow greater pelvic rotation. This increase of motion, in theory, allows players to make better contact with the ball. However, attempts to alter the angle of the run-up to players who typically have a straight run up does not help them improve the power or accuracy of their shots. This is probably because it feels forced and un-natural. When it comes to penalties (and indeed any skill under pressure), it is best to stick to what you know and what you feel comfortable with. In 2006, England lost in the quarter finals of the World Cup to Portugal on penalties. Cristiano Ronaldo confidently stepped up and scored Portugal’s 5th penalty. Unfortunately, it was a different story for him in the Euro 2012 semi-finals, when Spain eliminated Portugal. Ronaldo was again due to take the fifth penalty but didn’t get the chance as Portugal lost before his turn. 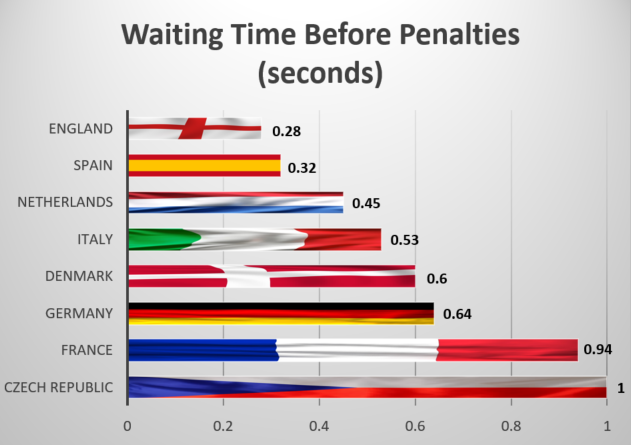 So when is the best time for your best player to take a penalty? Evidence suggest that you should put your best penalty taker in 4th or 5th position and the second best penalty taker either 3rd or 4th. This is because these are the penalties that will have to be scored in order to win or avoid losing the match. We think the risk of the match being over before they get a chance to take it is significant, so 4th is probably better than 5th.What about your weakest of your 5 penalty takers? It would make sense for him to go first or second, as this is the time in the contest where there is the least pressure. So hopefully that has helped sort the myths from the facts. You shouldnt trust left footers. Experienced stars do worse than their young rivals. Goalkeepers can put-off their opponents. In case you needed a quick summary of the other myths v facts, you can download the graphic here.